Halloween will be super fun this year! WHAT: Say NO to flimsy Halloween costumes that your child will outgrow! All you need are some batteries and some lights. DOES: Inspires, Educates, Illuminates Halloween and Beyond!!!!!!!!! AGES: 5+? Please help the little ones. But let them help in making it. 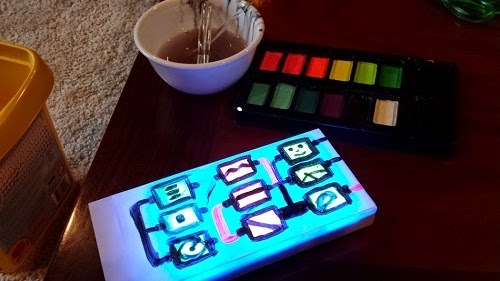 GIVEAWAY PRIZE: Get Blacklight Dimensional Fabric Paint + Blacklight Face Paint + your very own copy of Wearable Electronics by author Kate Hartman!!!! Quick, what do Halloween costumes and wedding dresses have in common? That's easy, right? You only wear it once. Even if you were to wear a wedding dress for the 2nd time, you are not going to wear what you wore for your first wedding, right? That is the problem with Halloween costumes too. Even if it still fits next year, chances are, your child would not be too thrilled to wear it. But what if Halloween costumes were like LEGOs? It would look modular and original and possibly even professional. All I know is that I am tired of buying expensive but still cheap-looking Halloween costumes that never fit right and is no longer usable the following year. I know it can be as cheap as $20 but I rather spend my money elsewhere. I made this from Scribbles 3 Dimensional Paint Pictured in the middle is Megs from the LEGO Adventure Book. Surrounding the image is an LED light strip similar to this one. Mine didn't come with a plug and so it is something you have to do a little soldering with but not much. Believe it or not, it is relatively safe and if you think about it, there are products that we all use that can be considered a wearable electronic like FitBit and LeapBand and even the Neocomimi Cat Ears. But there are others, lots and lots of others and the best time to take advantage of this is now. Why now? Because you have to buy a costume anyway. You might as well spend the money on some wearable electronics so that you can use them on another day but in a totally different shape or form. Yes, you can! Live outside of the box, people! It's roomier! 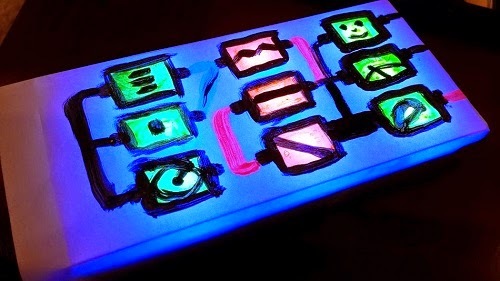 Imagine dressing up a light saber or a fairy wand with an electroluminescent wire.. It's the coolest. My son is trying to make a lasso or something.. Who knows... Either way, he is painting with light! It washed right off my very sensitive skin without a problem. I was grateful I got to shine! Here is what the Black light Face Paint looks like with UV light. This is origami paper. NOW here in complete darkness! I just happened to have this UV light source that is PORTABLE and rechargeable from a DuneCraft kit. Look how it makes our pretend "Robot Control Panel" glow! This was all painted using the dimensional black light paint. In daylight, you can see that it has lots of color. If you are going to a party with UV lights, you are going to stand out like bonfire at midnight! These crazy colors are totally amazing. During the day, they are bright and cheery neon colors but at night when a UV light shines on them, they glow beautifully. I love the fabric paints from ilovetocreate.com They work really well and their tulip-shaped caps stand up top-side down and that is just smart design. This post was inspired by Tester #5, our one and only tween tester. She came back from the Maker Faire with this! She had done it all on her own! 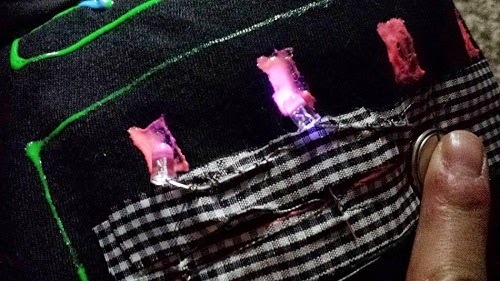 This is conductive thread being used to sew on an UV LED to the robot shirt. 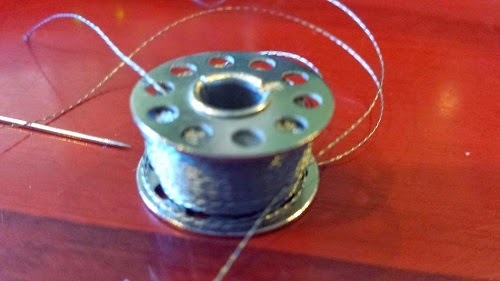 Very tough and works with a regular needle (not included). 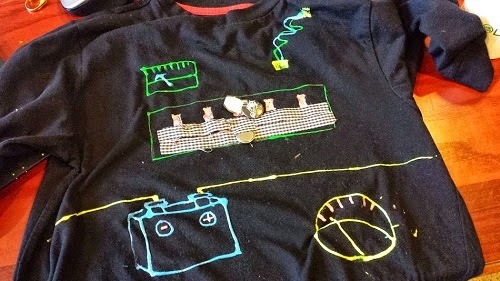 You can sew electrical circuits now. Woo Hoo! 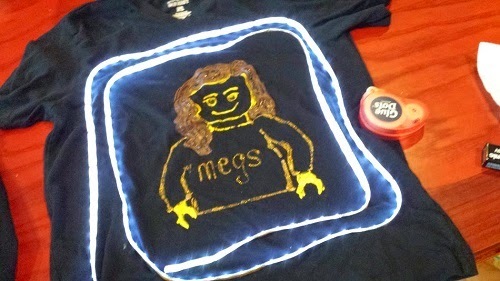 It was amazing to be able to sew lights onto a shirt. AND.... it was incredibly easy! I made a rudimentary switch and I have a couple of more weeks to get it right but I had to tell you now! This is the coolest thing. And best of all, you can remove and reuse pretty much everything. Depending how you sew, you might even be able to reuse the string!!! 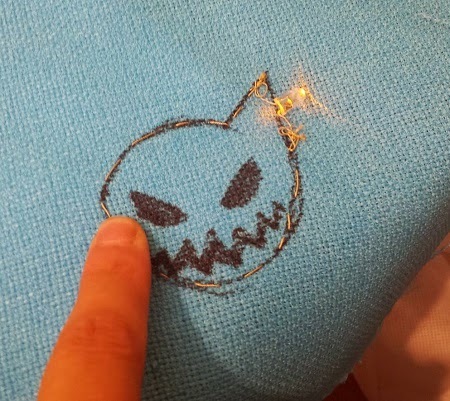 PSST... you can buy conductive thread at the MakerShed. Mine came from the UK and I didn't know it was from there until it arrived at my doorstep. No need to wait that long. He can wear this on his chest or wrist and interact with others! Fun! I think one of the easiest costumes to make is a robot because your robot can do anything. 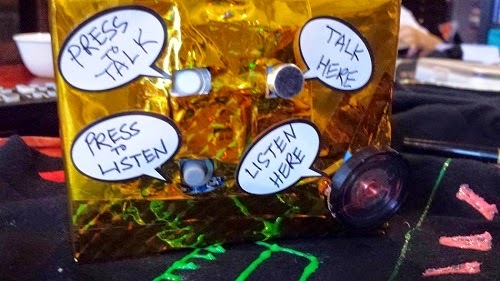 Our robot (child) will have a "Voice Copier" (a recording module from Radio Shack for $12) Fellow trick or treaters can press a button and say something silly, press another button and have it said back to them. Yes, it is super silly but this is the day you can do it (and get more candy) and best of all, you can use it for some other project some other time. People can conduct electricity but dead people probably can't, right? Anyway, it's Halloween! Photo-sensors available in the Maker Kit. The lights shut off when you shine something bright on them. Do you see that it is all connected by ink? That is silver! Look how busy this man is! 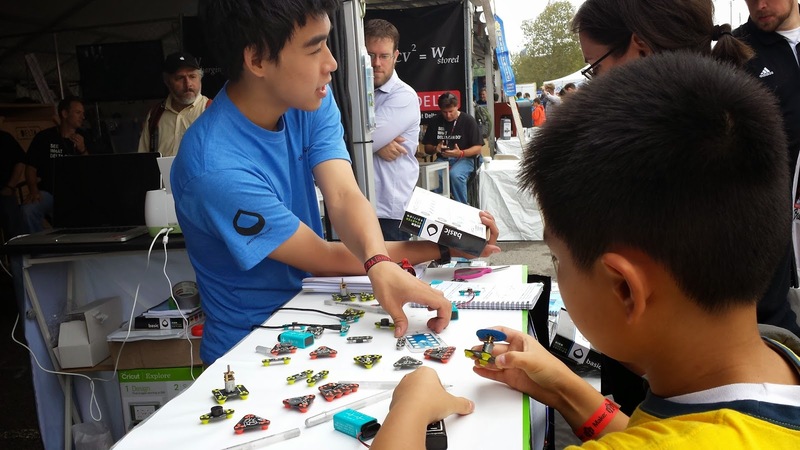 The Electroninks table was one of most fun booths we visited at the Maker Faire. Products like this are one of the best reasons to attend a Maker Faire. You find out the latest and greatest and you get to experience it live. Picture in yellow is Tester #1. We have a bunch of Snap Circuits here but since they were kind of heavy, I tried to make something lighter using a new kit I found at the Maker Faire. 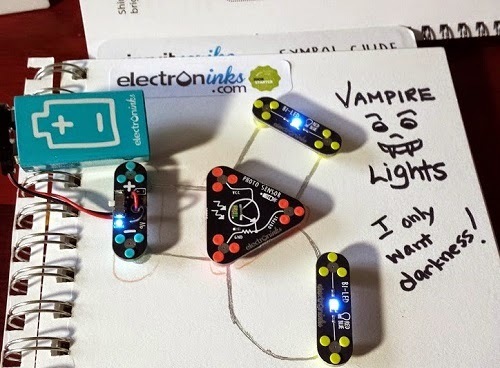 They are called Electroninks and they are totally wild. They stay on a surface because there are strong magnets attached to them. (box says ages 13+, probably because of the magnets and the SILVER INK in the pen!!!) But if you were to wear these modules, I would suggest fastening them more securely on somehow to make sure they don't get lost. PSSSSTTT.... if you want this for the holidays, get it now. The deluxe Developer Kit is already soldout. Do not wait... Expect a more detailed review. We will have more to tell you as we are trying the first three kits now. It's okay if you know nothing or if you know something. The book is well-organized so that you can start from where you are comfortable and go back if you have forgotten something. 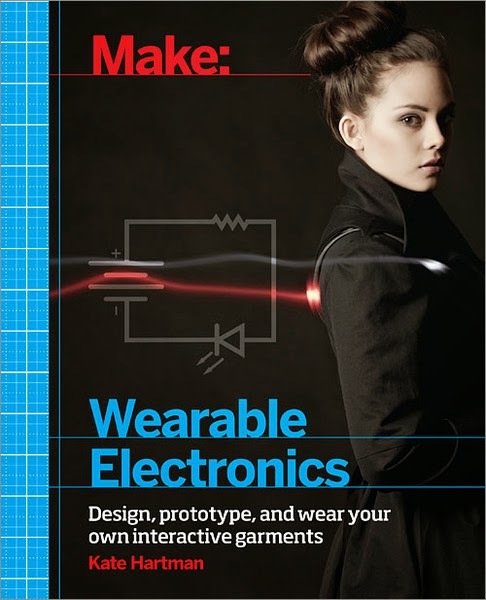 I found a great book at the Maker Shed called Wearable Electronics by Kate Hartman. (starting at $14.99) I love that you can be a total novice and learn about electronics from this viewpoint. It's not like you have to have been soldering for a few years to start such projects. However, if you do know something already, I bet you will learn a lot more. Oftentimes, kids are learning about electronics but their bodies and clothes are not part of the project but that is the goal in this book and I think that is ABSOLUTELY fascinating. 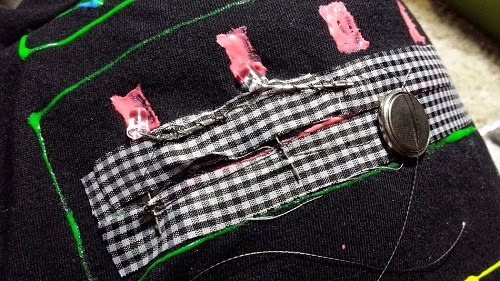 This can get boys sewing and techy girls can feel at home without all the pink and purple if that is not their thing. Cool applies to both genders equally here! Check out her TED video below! Think about the possibilities!!! I have lots of dreams!!! I would like to build a mood ring-like device for my kid in which he will see colors based on his heartbeat. ie. "you want to see red when you are in gym but you don't want to see red when you are in the classroom, okay?" OR maybe get a volume indicator that a child can wear and will buzz if he starts talking too loud? Number 2 is so totally in need of that! Why wait for this to be invented. Make it yourself NOW. That is why I have this book. This kind of technology improves quality of life for so many people. LED finger lights True: My son's allergist uses the green one to examine mouths. 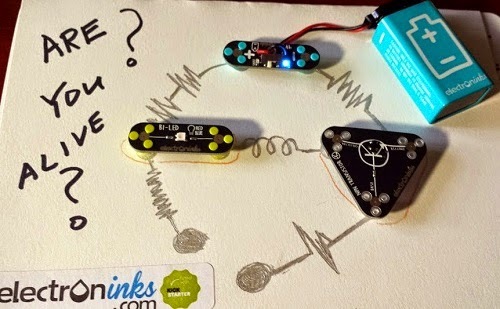 Sometimes you will see a "price + FREE SHIPPING" but that product might be coming from China or the UK or who knows where and so you need to consider the time.I purchased a sound-activated EL Wire last week that still hasn't come in yet... oh well..... So if you are in a hurry, make sure it is from a reputable store like MakerShed or you have Amazon Prime or Super Saver Shipping if time permits. 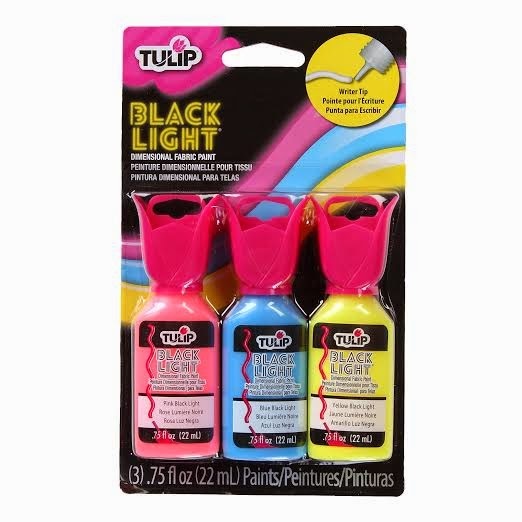 Also, a lot of these products on Amazon look like everyone else's and so it might be hard for you to figure out what will not be a dud because these things are cheap so you just never know (although I've been quite lucky- phew!). I didn't purchase my EL wire at the MakerShed but I trust this store and so if you want a very long EL wire, I bet this 25 ft pack will be awesome. 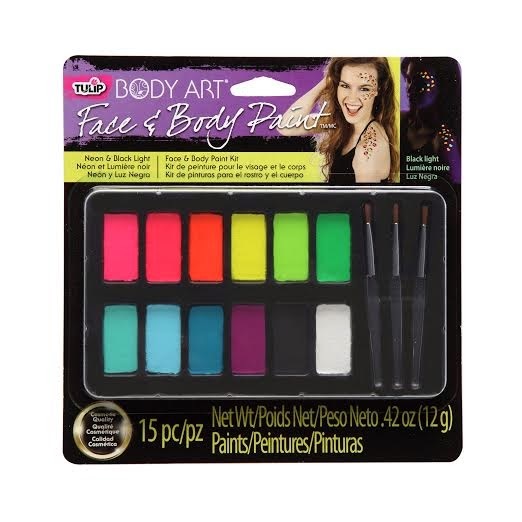 USE Rafflecopter to win this unbelievable prize- Fabric Paint, Face Paint and the Book that is bound to change the way you view how your body and clothing can interact with electronics!